By Christine Valters Paintner and Betsey Beckman. 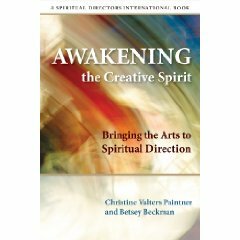 Published by Morehouse Press as part of a series by Spiritual Directors International. Available for purchase from Amazon. “We have been far too left-brain, verbal, and linear in our attempts to transform and mature actual people–intellectually, emotionally, and spiritually. Here we have two women filling the tragic gap–and beautifully so! Spiritual direction is the growing edge of ministry today and this excellent book will surely direct that growth.” – Fr. Richard Rohr, O.F.M. by Betsey Beckman, Nina O’Connor & J. Michael Sparough, S.J. Your directors for this retreat, Praying With Our Bodies, are Our Lady, Dominic and Ignatius. Our Lady—Mary of Nazareth, widowed woman, survivor, sojourner, seeker of sanctuary, marginalized woman, woman pregnant with hope—teaches us how to let the Spirit pray through us in word, in silence, in stillness and in movement. Our other two mentors, Dominic, founder of the Order of Preachers, and Ignatius, founder of the Society of Jesus, are well known for their steadfast devotion to Our Lady. They, too, have much to teach us about how to let the Holy Spirit pray in us through the “temples” of our bodies. Dominic taught his followers nine ways of corporal prayer, and he leads us in these practices. Ignatius teaches us to honor and welcome the imagination in our contemplations. Includes numerous movement-prayer exercises for use in private or communal prayer.